An electric fence is the first line of defense to your home and business. If you are serious about protecting your premises from unwelcome intruders, installing electric fencing is one of the best choices you can make. It keeps criminal elements at bay. Your average thief thinks twice about an attempt to breach an electric fence. He will obviously expect a nasty shock. But even if he finds a loophole in the security, it is more difficult to negotiate a climb out with loot in hand. We do numerous types of electric fencing ranging from standard wall top fencing, 6 to 8 line fences, to more industrial free standing fences going up to 30 Lines. Furthermore, we can adapt and design to your individual needs. This means that, whatever the environment or soil, you can still have an electric fence. As a standard we use trusted Nemtek products. As they are the biggest supplier of electric fencing equipment in SA, we always have the right equipment to work with. Their standard range on Energizers include the Wizord 4Joule for small to medium fences and the Merlin M18 8Joule for medium to large fences. Moreover, we keep all our electric fencing parts in stock, so that installation is quick and painless. There is very little maintenance involved for the customer, besides keeping the area around your fence clear of shrubs and overhanging branches. We will maintain and repair your fence for you as needed. At MF, we go the extra mile to provide you with affordable fencing. Obviously, price is dependent on the type of fence and quantity of material you require. So, if you need electric fencing for your business or household, repair or advice on your existing fence, then call the experts at MF Security Systems today. Please call us on 011 763 4313 or email us on [email protected] for a free quote on new installations. Please note that we charge a call out fee to do repair quotes. 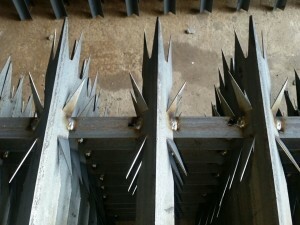 Domestic and Commercial Electric Fence Installation West Rand & Randburg Areas. We also repair and maintain electric fences.